Flora/Fauna Wines-Wine NotesDo you even Sonoma Coast, bro? Do you even Sonoma Coast, bro? Hirsch Vineyards 2014 San Andreas Fault Pinot Noir can show you how it's done. Lying adjacent to the San Andreas Fault on the extreme western Sonoma Coast, Hirsch Vineyards is comprised of 72 acres, divided into 67 individual farming blocks. The resulting degree of fragmentation is unmatched even by the famously subdivided vineyards of Burgundy’s Côte de Nuits. Due to the site’s proximity to the Pacific Ocean and the San Andreas Fault, the vineyard has a fearsome diversity of soils, aspects, elevations, and microclimates. This complexity defines our farming and winemaking practices: each block was individually developed and is now farmed, harvested and vinified separately. 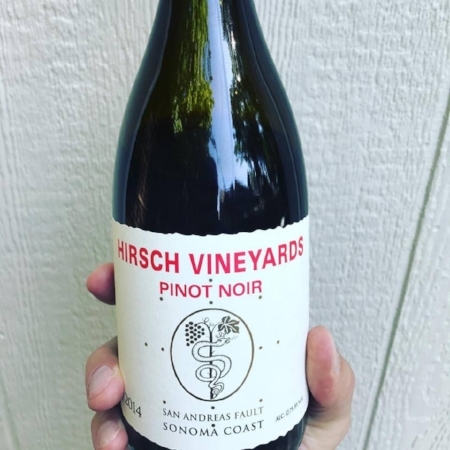 The San Andreas Fault is Hirsch Vineyards’ signature pinot noir and is crafted to represent the entirety of this multifaceted vineyard. The 2014 San Andreas Fault has fruit from 32 distinct farming blocks, more than any other wine made from the Hirsch Vineyard. It is the flagship wine from Hirsch, and the wine that represents the summation of our complex vineyard.